We love our acronyms in marine science, and TOBI stands for Towed Ocean Bottom Instrument. TOBI is a large platform rather like a giant bedstead, which is towed behind the ship on a cable. TOBI flies a few hundred metres above the seafloor, which allows it to map the bottom in much greater detail than instruments carried by ships thousands of metres above. TOBI carries a variety of sensors, but chief among them is a side-scan sonar system. This sends out a fan of sound waves sideways across the seafloor. 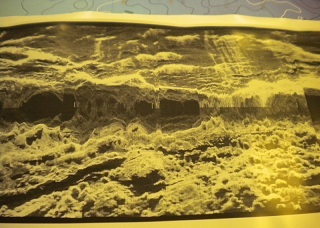 By analysing the strength of the returning echoes, TOBI builds up a map of the nature of the seabed. For example, TOBI images show where the seabed is covered in soft sediments, and where it is bare rock. This information allows our geologists to piece together the history of different parts of the ridge that we are studying. Sedimented areas usually represent older crust, where there has been more time for sediments to build up. Bare rock areas are often fresh, young lava flows that haven't had time to accumulate sediment cover. TOBI also highlights features in the seafloor terrain such as faults and scarps, further aiding geological interpretations. TOBI maps a stripe of seafloor six kilometres wide - three kilometres to either side of the vehicle - as it is towed along behind the ship. By running several parallel survey lines less than three kilometres apart, we can build up a map of the area with no gaps - a survey technique nicknamed "mowing the lawn". The challenge with TOBI is knowing exactly where it is behind the ship. This requires keeping an eye on the position of the ship, and the amount of cable paid out with TOBI on its end. From this, we can calculate how far TOBI is behind the ship. During scientific watches when TOBI is in the water, the watch-keepers make these calculations every half hour and plot the positions on a large chart in the main lab. 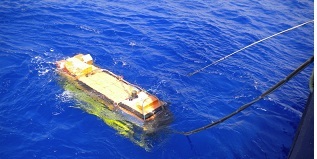 This allows the TOBI operators to haul in the cable if necessary, so that TOBI flies clear of possible obstacles such as underwater mountains. TOBI has been in service for twenty years, though continually updated and upgraded. 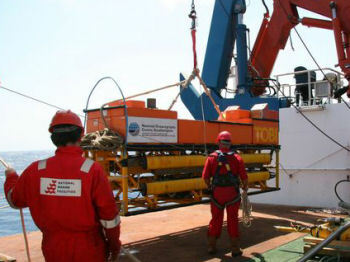 Today TOBI also carries a magnetometer, which measures the magnetic field of the rocks of the seafloor. This allows geologists to measure how far blocks of rock have rotated as the crust spreads apart at the volcanic ridge. By giving us a clearer picture of the seafloor, the maps and information collected by TOBI help us plan where to hunt for deep-sea vents. So mapping the area with TOBI, which takes several days, is an important first step during our expedition.